If one of your social media goals involves figuring out how to get followers on Pinterest, you’ll want to Pin this guide. A good appreciation of Pinterest’s user base will help when it comes to crafting content for your profile. The majority of Pinterest users are women. Only 30% of its users are men, but that figure is growing. Pinterest reaches 83% of women aged 25-54 in the U.S. That’s more than Instagram, Snapchat, and Twitter. Millennials are Pinterest’s most active age group. One in two U.S. millennials visit Pinterest every month. Almost half of Pinterest users live in the United States. Pinterest is the only major social channel in the U.S. with a majority of suburban users. Find even more Pinterest stats that marketers need to know, as well as more Pinterest demographics. Take a look at what’s already performing well on Pinterest by browsing the Popular feed. Take notes, evaluate commonalities, and consider how you could apply these ideas to your own content. When you come across compelling content, consider re-Pinning to one of your boards, following the user, or writing a thoughtful comment. All of these actions will increase your brand’s exposure on Pinterest. Search for the top Pinterest boards in your company’s categories and ask to join and contribute. In some cases the board administrator will include instructions on how to join the group’s description. If not, contact the board owner directly by email. You can usually find them by looking for the first person listed under the board’s followers. Pinterest favors originality. Pinners use the site to look for new ideas, inspiration, and products, so make sure your own Pins are super fresh. According to Pinterest, the best performing pins have three things in common: They’re beautiful, interesting, and actionable. In that order. Pinterest is first and foremost a visual platform, so make sure you use eye-catching images. Use high-resolution and high quality images. Use lifestyle images, which tend to be more alluring than standard product shots, according to Pinterest. Avoid images that are too busy. Favour vertically-oriented photos over horizontal ones. A whopping 85% of users search Pinterest on mobile, which means vertical images have much higher impact. Don’t make images too long, or they’ll be cut off. The ideal aspect ratio is 2:3 (600px wide x 900px high). Consider showing multiple products in a single Pin. Pinterest finds that Pins with multiple products can appeal to different tastes and spark curiosity. It’s best to maintain a four-product limit per Pin so as not to overwhelm. Try video! If you have the resources, short videos have the power to stand out among even the best photos. If you don’t, check out Hootsuite’s social video toolkit. Your beautiful image may have captured attention, but to keep that attention you also need a stimulating caption. Go beyond short, single-sentence descriptions and provide information that would compel users to take a deeper interest in your brand. Remember, the most effective Pin descriptions are interesting. Pinterest is essentially a search engine, so your content should be optimized for discoverability. Make sure your descriptions are keyword-rich and include relevant hashtags so that you appear in relevant searches. Use guided search. Start by putting a few keywords in Pinterest’s search bar, and take note of the automatic suggestion. Note the key word bubbles that appear in the search results header. Look at the hashtag suggestions and usage stats as you add hashtags to your Pin descriptions. Search a relevant hashtag, and look at the tags and keywords being used by Pinners using that hashtag. Look at the trending hashtags in your category (only available on the mobile app). Try these 8 SEO tools for social media marketers. You can apply this logic to your profile too. For instance, consider adding a description to your name, like Hootsuite (Social Media Management). Your profile is more apt to show up in keyword searches that way. This is especially useful if you’re an entrepreneur and you want to emphasize your areas of expertise. Boards can also be optimized for search. Make sure your board names are specific and accurately describe their contents. Use appropriate keywords in the board name and description, and add relevant hashtags to the description, too. If you’re not sure which category to put your board in, look through the categories to see where yours fits in best. 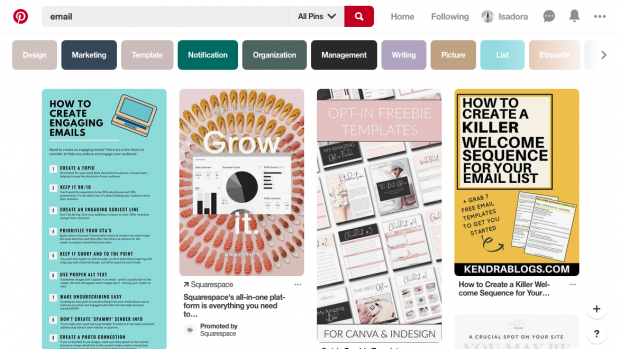 Pinterest recently added Sections to help organize boards. For example, if you have an expansive board category like Home Décor, you can now create separate sections for each room. Doing this can add credibility to your brand and make it easier for prospective followers to navigate your content. Again, be descriptive and use keyword-rich language for your sections. Here’s an example called Seasonal Eatings, and another called Tokyo. Entice followers by describing the benefits associated with your products or services. “Positive sentiment goes a long way in showing how a Pin from your business can help [Pinners] in their lives,” said Kevin Knight, former head of Agency and Brand Strategy at Pinterest. Get personal and use “you” or “your” in the copy too so that users know you’re talking to them. Rich Pins add additional details to your Pin using metadata from your website. There are four types of Rich Pins you can add to your account, including app, article, product, and recipe Pins. If your brand sells products, Rich Pins will display real-time price and availability details. Article pins are great for publishers or bloggers as they display a headline, author and story description. The reach of content on Pinterest accrues over a longer period than it does on other platforms. Play the long game by publishing content consistently over consecutive months. According to Pinterest, this is the best way to grow an engaged audience. Maximize your content’s reach by making sure you Pin at the right time. Most Pinning happens between noon and midnight, with 11:00 pm as the most active hour of the day. Since Pinterest is very often used for planning, it’s a good idea to stay ahead of the calendar. Pinterest recommends that brands share seasonal content up to 45 days before a holiday or event. Sometimes Pinners even plan three to four months in advance of events. Save time by easily scheduling and publishing Pins from Hootsuite’s dashboard. Pinners are known to generate a flurry of activity as they get into the holiday spirit. Mother’s Day attracts more than six million users, pinning upwards of 12 million gift and celebration ideas each year. Christmas, of course, is always a major event, drawing 33 million Pinners and generating 566 million pins every year. Get in on the holiday action by planning with Pinterest’s Possibilities Planner. Create on-brand holiday content and share it with relevant keywords and hashtags. 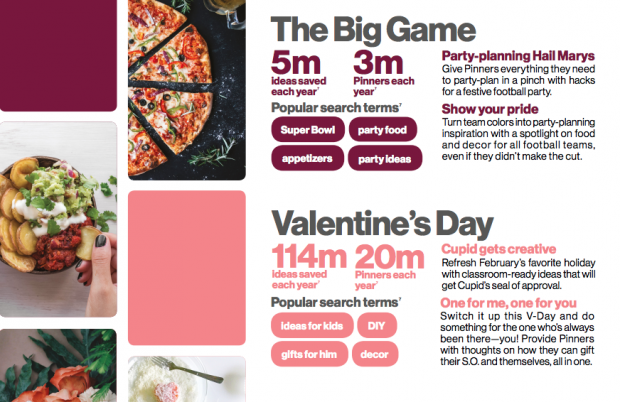 Pinterest includes popular search terms for each event in the planner. Make following your company easy with the Follow button. Install the button on your website, in newsletters, in email signatures, or really anywhere online that you think you might attract followers. In other situations, you can also use the Pinterest P icon to promote your brand’s profile. Make sure to also link to Pinterest in the bios of your other social accounts. You can also make your website visitors aware of your brand’s Pinterest presence with the Save button. With the Save button, visitors can also share any image from your website on Pinterest, making them ambassadors for your brand. ELLE Germany added the Save button on their web and mobile sites and in just one month found that three times as many Pins were being shared from its site. To make sure your profile picture shows up alongside the Pins users are saving from your website, you need to claim your site’s authenticity with Pinterest. Doing this will also provide website analytics, allowing you to get a better sense of what visitors are saving from your website. Another way to integrate your Pinterest account with your website is with widgets. In addition to the Save and Follow button, you can embed Pins, showcase your profile, or display a board on your website. Website visitors who have Pinterest accounts will be more compelled to follow you after seeing these previews of your Pinterest content. Much like QR codes, Pincodes are designed to help people find your company on Pinterest while offline. Pincodes can be added to business cards, brochures, print ads, packaging or any other merchandise. A quick scan with the Pinterest camera will bring them directly to your Pinterest profile, board, or pin. If you have a social media budget to work with, Promoted Pins are a great way to increase exposure. Choose a Pin that’s already performing well and target it to reach new prospective followers. Your Promoted Pins will appear just like regular pins in the feeds of more Pinners. Pinterest’s ad targeting capabilities allow you to find new audiences based on interests and keywords. It’s a great way to discover users who might be interested in your brand. Actalike targeting will help find users that reflect the interests and behaviours of your most valuable customers. Engagement targeting is a good way to connect with Pinners who have already engaged with your brand. Retargeting these users with a follow call-to-action may be what’s needed to forge the bond you’ve already been forming. Don’t forget to search for pre-existing customer audiences, too. Brands can upload website visitor lists, newsletter subscriber lists and CRM lists to connect with pre-existing customers on the platform. 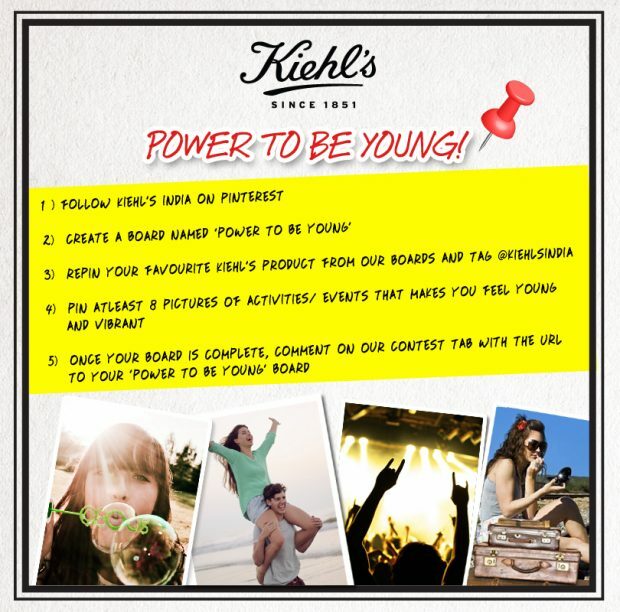 Create a contest with a follow on Pinterest as an entry requirement. Consider creating a hashtag and a shareable image so participants can encourage more followers to join. 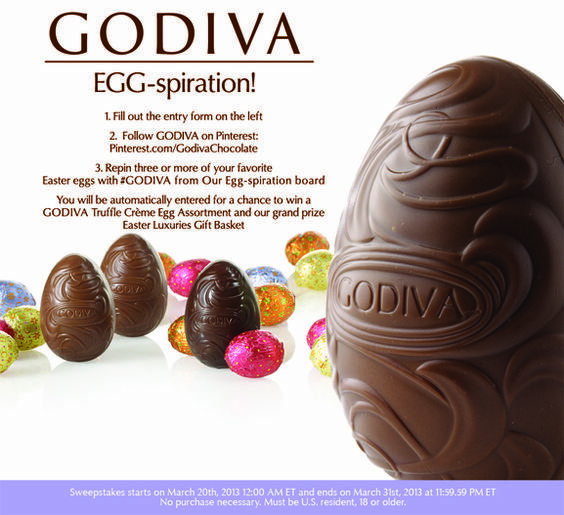 Always make sure your rules of entry of clear and comply with Pinterest’s contest guidelines before getting started. Don’t require people to save a specific image. Don’t allow more than one entry per person. Don’t imply or suggest Pinterest sponsorship or endorsement. Follow all relevant laws and regulations. 24. Test, evaluate, adjust, repeat. Any good social media marketer knows that trial and error is a fundamental part of the job. 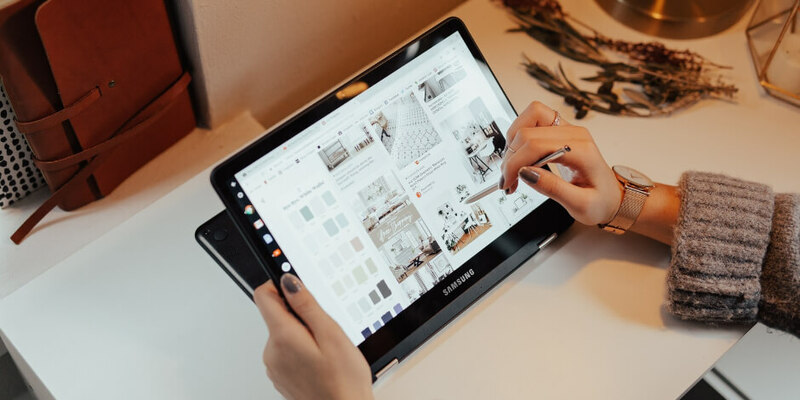 Pinterest analytics offers several tools and actionable insights that help you see how your audience is engaging with your content. Whether something is working or not, it’s always good practice to take a step back and evaluate why. After you’ve learned why something works, it will be easier to apply in the future.